There's no USB 3.1 Type-C port, only a single M.2 port, and the pair of fan headers are going to leave you wanting if you have an all-in-one liquid cooler with a header-powered pump, fans, and several case fans. In fact, we can back up that claim by our need to fish out a fan splitter cable in order to power our AIO cooler and test bench fans at the same time. 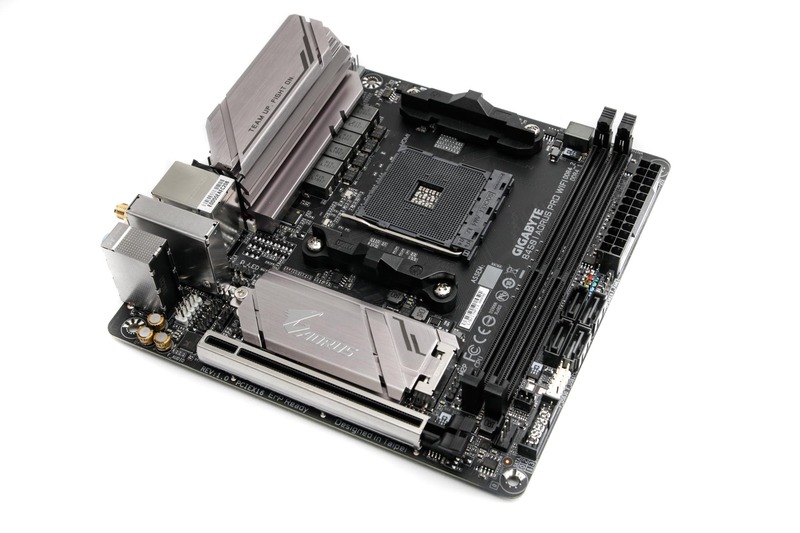 You expect fewer features on a mini-ITX motherboard, but we feel three headers is a minimum for a typical modern PC. The lack of these features contrasts others on the board, oddly. For example, you get a very snazzy M.2 heatsink, which shaved 9°C off the load temperature of our Samsung 960 Evo - not the biggest drop we've seen, but on mini-ITX boards the top-mounted M.2 port is always in a cramped space between the DIMM slots and GPU so is rarely able to make use of any local or case airflow and maximise the benefits of the heatsink. 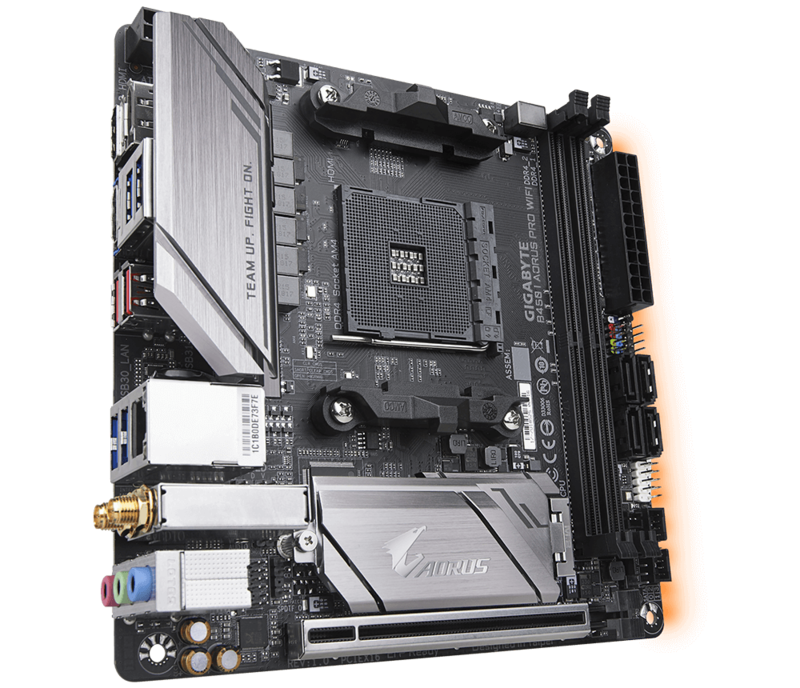 The exception here is Asus' recent ROG Strix boards that have a raised M.2 port, which does allow for better cooling. You also get Realtek ALC1220 audio - something Gigabyte seems keen to push with its mini-ITX boards despite the low price, as the AB350N-Gaming WiFi had it too, rather than dipping down to cheaper and worse codecs. 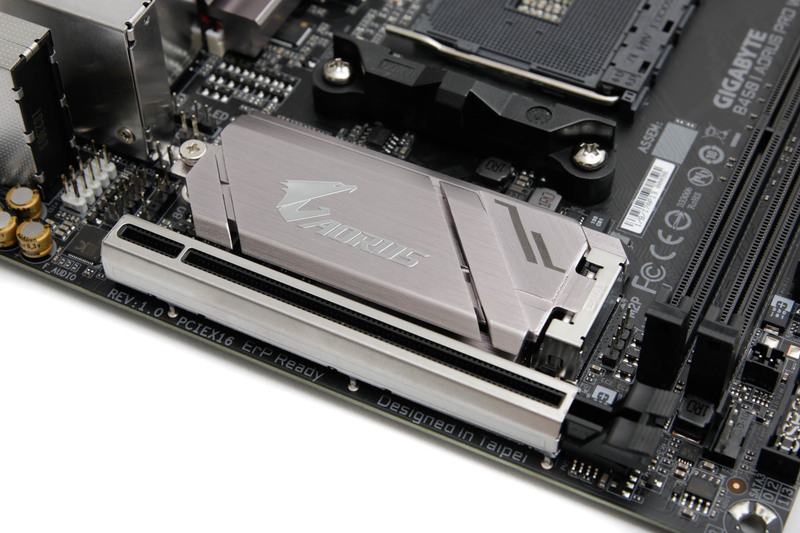 The M.2 port, thankfully, has the full range of support for the variety of SSDs out there and dishes out either PCIe 3.0 x4 or x2 bandwidth as well as supporting SATA 6Gbps M.2 SSDs, and beneath it is the single 16x PCIe slot that features Gigabyte's Ultra Durable armour. Layout is pretty good too with all of the SATA ports located on the right side of the PCB, so there's no need to thread them around or over the DIMM slots like there is on some mini-ITX boards. 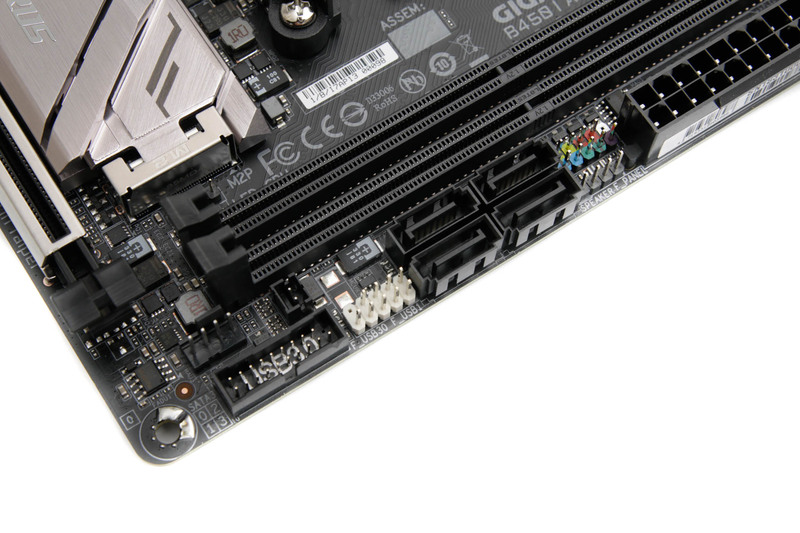 RGB lighting is fairly restrained with the AB350N-Gaming WiFi with a row of LEDs under the right side of the PCB but nothing up top except a 3-pin addressable header for your own RGB LED strips. There are also no overclocking or testing tools - you're left with just the standard two pins to clear the CMOS. There does seem to be something unbalanced about the features on the board overall - the lowly power circuitry and pair of fan headers are in contrast not just to top-notch ALC1220-VB audio, Intel Gigabit LAN, and an M.2 heatsink, but also a trio of video outputs as well as onboard 802.11ac Wi-Fi, but it's clear that paired with something like AMD's Ryzen 5 2400G APU and its included air cooler, the B450 I Aorus Pro WiFi will feel much more at home than it would in a high-end mini-ITX gaming rig. You also get a reasonable six Type-A USB ports in total, with the four in addition to the two red USB 3.1 ports all being USB 3.0. The only other gripe we have is the set of audio outputs, which lack optical support and will also require the use of the onboard audio header to provide enough ports to power 7.1-channel speaker systems.